Summer is definitely the most popular time to visit Niagara Falls. The kids are out of school, parents are able to take their vacations from work, and the weather is superb. However, since summer is such a popular time to visit, crowds and long lines for attractions can be a drawback. So why not plan your vacation for one of the best times to visit Niagara? 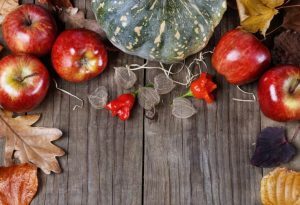 Autumn is wonderful time to be in Niagara and the surrounding areas, so planning your autumn trip now can put you a step ahead of everyone else, and here are just a few reasons why. While summertime temperatures in Niagara are never very hot, the weather in autumn is much cooler and drier. While some might find it a bit chilly, especially with the mist coming from the falls, autumn is still a very comfortable time of year to visit. 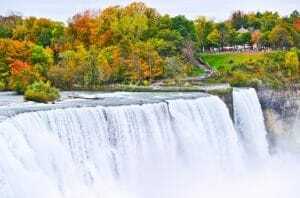 Additionally, the Niagara area sees spectacular fall foliage and hiking the area and visiting the parks will give you an up close glimpse of autumn’s stunning beauty. The contrast of the colorful trees and the falls always makes for impressive photos. Off-peak season in any tourist area often means lower prices. Hotels may lower their rates and ticket prices for attractions may be reduced as well. Do your homework and compare prices. It can also help to call hotels directly to enquire about seasonal rates and discounts. Restaurants in the area may also offer special discounts on food to compensate for the fewer visitors. Check their websites to see if online coupons are available. Perhaps the best reason to visit Niagara during the autumn months is the fact that fewer people will be there. On weekdays you may even feel as if you have the whole place to yourself. Without the crowds to contend with you and your family can enjoy Niagara to the fullest, without any pressure. Additionally, if you’re planning a group trip you should also consider the autumn months for the same reason. Group or large family trips are hard enough to manage, so the fewer crowds make it easier for everyone to enjoy themselves. Niagara is a bountiful agricultural region and many of the produce grown in the area isn’t ripe and ready for harvest until the fall months. This means that the local markets are brimming with fresh fruits and vegetables and you can even visit local farms for a pick-your-own adventure. Local restaurants rejoice at this time of year so expect to find inspired dishes created with local ingredients at eateries throughout the area. Niagara is special at any time of year, but autumn might be the best time for you and your family to plan your trip. Discounts, fewer crowds, and the fall scenery are just a few of the reasons why you should choose autumn as your best time to visit Niagara Falls.